If you’ve ever walked through the oral care aisle in your local grocery store or perused whitening kits online, you may be surprised by how cheap they are. They promise to make teeth several shades whiter in the comfort of your own home and at a price like that, what do you have to lose? Unfortunately, when they say something looks too good to be true, it definitely it is, and this case is no exception. Once you look at teeth whitening in Calimesa, you’ll realize there’s no comparison to over-the-counter whitening kits. Keep reading to learn about the difference. The reason store-bought whitening kits are so much cheaper is because the concentration of bleaching agents used to whiten teeth is significantly lower than what your dentist offers at his office. For example, a typical over-the-counter bleaching kit contains about 10 percent carbamide peroxide, an ingredient specifically designed to whiten teeth. On average, professional grade kits can have anywhere from 25 to 40 percent of hydrogen peroxide. Furthermore, many of these store-bought kits don’t stay on your teeth as well as professional-grade ones do. They either fall off after enough time or they don’t cover as much of your teeth as they should, causing irritation on your gums and reducing the effectiveness of the whitening. 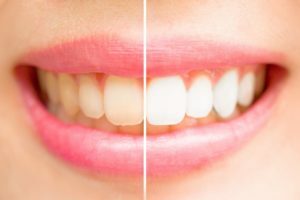 When you purchase treatments for teeth whitening in Yucaipa, you can expect two major differences when compared to over-the-counter alternatives. First, the concentration of whitening agents has more predictable results. In fact, a professional kit can make your teeth up to ten shades whiter with its activated whitening gel. Second, the applications trays used to conduct the whitening are custom-fitted, unlike store bought trays which are either too big or too small to provide the right coverage. Custom-fitted trays seal the whitening gel onto the surfaces of your teeth, preventing saliva from accessing and neutralizing the whitening agent. Once you receive your kit for teeth whitening in Calimesa, you’ll need to wear the trays for about 10 to 14 days for 30 minutes per day. Once you achieve the shade you’re looking for, you’ll just need to practice proper upkeep to retain your whiter smile. A great way to touch up your smile is through a whitening weekend. This means wearing your trays for 30 minutes over a two-day period. However, if you drink beverages that are known for staining, you may need to do it more often. Still not convinced that teeth whitening in Calimesa is the way to go? Schedule an appointment with your dentist today to see proven results yourself! Dr. Scott Parker earned his Doctor of Dental Surgery degree at Loma Linda University. Since then, he’s been practicing dentistry for over 8 years and continues to pursue education in dentistry to stay up-to-date. To learn more about his teeth whitening treatments and practice, contact him at (909) 795-6019 or visit his website.